President's Message: There is work for all! The snow and cold have finally gone, the tiny spears are shooting up from the ground. And as the trees begin to blossom, their tiny banners and pennants flutter in the breeze. We begin the task of preparing the soil as well as our mind for the planting of the seed for harvest. At the last State Grange Session a resolution for a Heritage Day was passed. The Heritage Day is for Granges to open their halls to the community to explain the Grange and to get new members. As April is Grange month it is time to celebrate the Grange and our members with award recognition and citizen awards. Degree Days can be used to explain the lessons of the four degrees to prospective members and to those that have been welcomed but need to witness the conferral of the degrees. Inspection season has begun and I hope that every Grange welcomes their Deputy and or Designated official to the hall and have all the materials present for the inspecting officer. Our goal is to view the strong points as well as the weak points and try to work with those Granges that are in need of assistance. We in the State Grange cannot give help unless it is requested by the Community Grange. 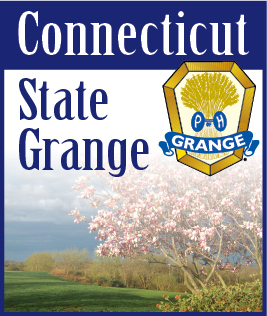 So I ask you that if the State Grange can help your Grange please call. March 18th we participated in Ag Day at the State Capitol. I wish to thank Chris and Gordon and those others who helped that day to meet the legislators at the Capitol. This year we did not hand out cookies as in the past because of a requirement for a license from the health department. We were able to get the word out about the Grange and the good things our members are doing in their communities. The National Grange is still seeking financial support from its Subordinate Grange members, by either donating to the Trademark Litigation Fund, National Youth Travel Fund, Kelley Farm Trust Fund, and the National Grange Foundation. Letters have been sent to most Granges seeking donations to the National Grange. If individuals donate to these funds then the dues may not be increased, as more money from outside sources will protect you from a National Grange increase. The National Grange is looking for ways to increase revenue, by corporate sponsorship, increased services, hotel, rental car, prescription drug, hearing aids, and others that are available on the National Grange website. Check it out. We are making plans for the upcoming events so please watch for news and items coming from our Committees and this office.